This morning, Brian and I worked on his letter to Santa Claus. He took it very seriously and it had to be "just right." He asked me to write the note portion as he dictated it to me. 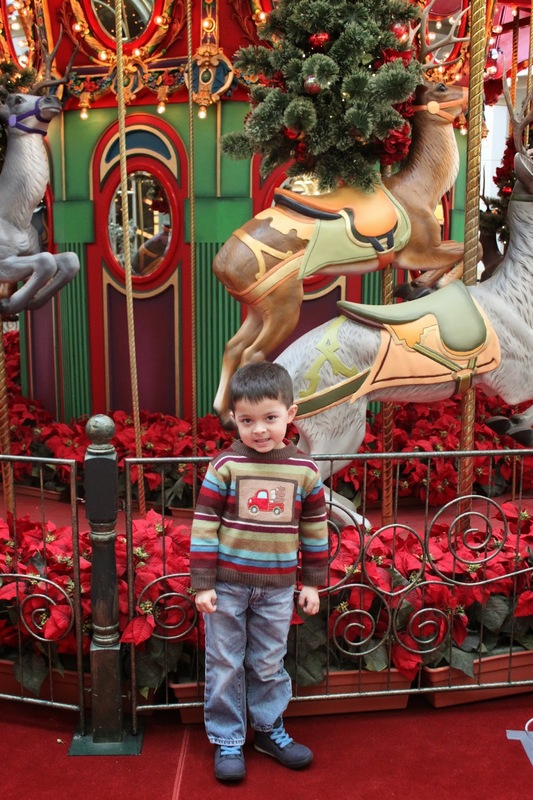 Brian was SO excited to visit Santa and wanted to be sure he asked him about visiting Heaven and bringing presents for Hope. 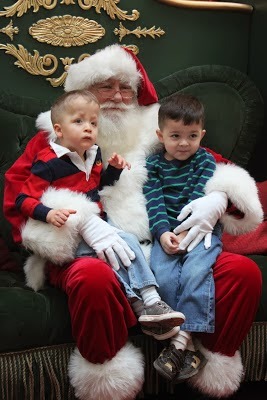 Last year we had two experiences with this Santa. The first time, I found myself so distracted with getting the right photos and trying to get Gavin to smile and wanting to capture the moment - that I truly "missed the moment" entirely! You can read that entry HERE. So, a few days later - I had a "Santa Do-Over." I brought little "cheat sheets" for both boys, left my camera at home and listened... really listened. I listened to what Santa said to Gavin. I memorized Gavin's expressions and his clapping. 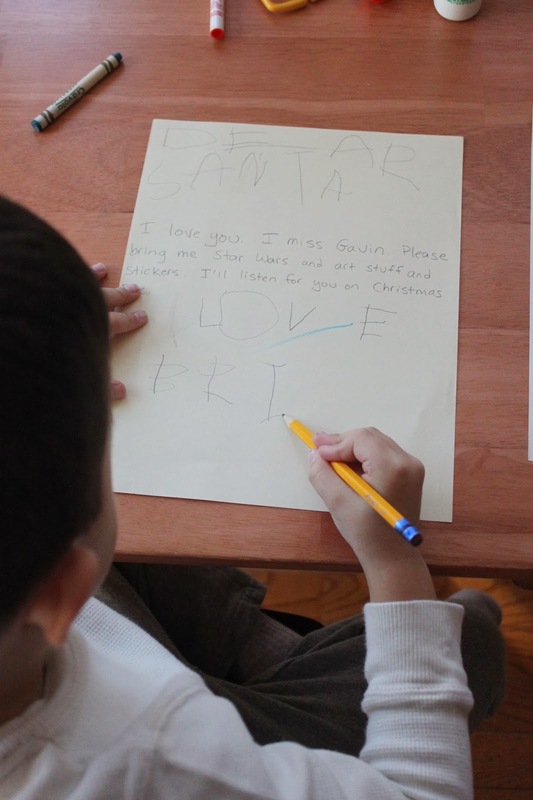 I listened to the conversation between Santa and Brian and marveled that Brian thought of Gavin when he gave Santa his list of "wants." You can read about that special day HERE. 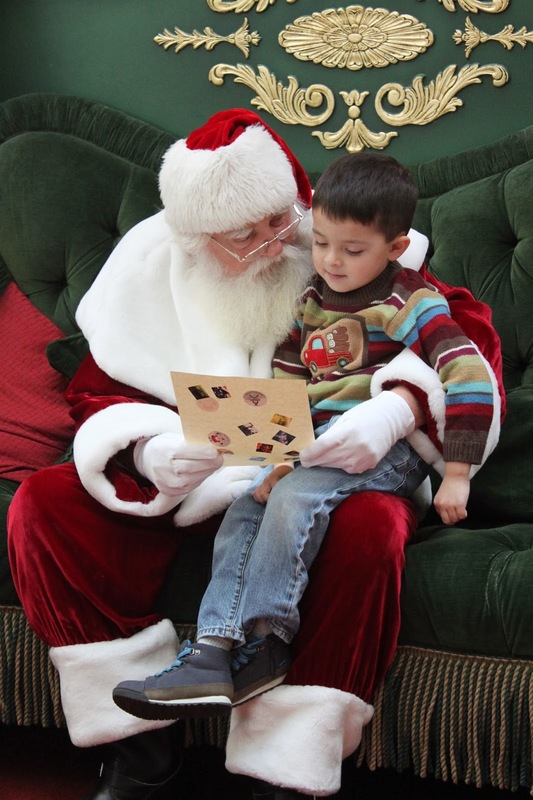 After our visit, I wrote this Santa a letter. He spent so much time with each of the boys - he remembered every detail from my little cheat sheets - and he made the whole experience so magical. For Gavin, especially, I wrote to him in my letter. I told him that Gavin didn't like being held in one place and was usually pretty squirmy. But he had such a calming presence - and when I told him that Gavin loved music, he actually started singing. Gavin instantly melted into his arms and smiled - completely mesmerized. I wanted him to know that special people are called to be Santa - and he clearly answered that call. I just wanted him to know how grateful I was. So today... as I sat next to him on his huge chair... I started to tell him about Brian when he stopped me. He knew. He remembered us. He thanked me for my letter and told me how much it meant to him. He said he has told the story several times since last year about the little boy with special needs that was fidgety until his Mom said to sing to him - and then he was completely calm. I told him that Gavin had suddenly and unexpectedly passed away and he was so sad. But he remembered him. I couldn't believe it. We gave each other the biggest hug and he patted my belly and I introduced him to Hope and he smiled. I got up and walked over to Brian to take his hand and my eyes met up with Ed's. It was hard for us to hold it together. Brian sat with Santa for quite a while. Santa reassured him that he does make it to Heaven and Gavin will have a wonderful Christmas there. They talked about Star Wars and Brian's wish that his little sister have presents under the tree. And then he told Brian that part of being a big brother is helping Mommy with all the stinky baby diapers... to which Brian started laughing hysterically. Today was not easy for us - but it was magical. And Gavin was there. I know it. So sweet. How beautiful. Your a great mom. Blessings to all of you. Awww...bittersweet, as I suspect the last 7 months or so have been. Looking at Brian's sweet smiley face can't help but make me smile back. And, Baby Hope! Just around the corner now! A brand new baby at Christmas always seems extra-special to me. Blessings on your dear little family. Such a special (and emotional) post! What a wonderful Santa that he remembered you from last year and even more wonderful what he told Brian about Heaven. That truly brought tears to my eyes. Such a heart warming story. Thank you, thank you for sharing your life with us. I look forward to "hearing" from you everyday! Hugs! I don't often cry when reading blogs, but this one brought tears to my eyes. How blessed you all are to have had just the right Santa there for you, not once, but twice. You also play a large part in Santa being able to be so right for your dear children, with all the wonderful preparation and coaching you do (both for the boys and Santa). Loved this post! I have tears on my cheeks. What a wonderful Santa you have found! Embracing your family this holiday season!! Oh my....I'm crying. I always get so caught up in the emotions this time of year and the magic of it all. I Hager met Gavin, but miss him. Strange, I know. What a wonderful post, Kate. I was introduced to your blog via Momastery prior to Gavin's death and have been following it regularly since. Beautiful post. If this man isn't the closest thing to Santa I don't know who is. 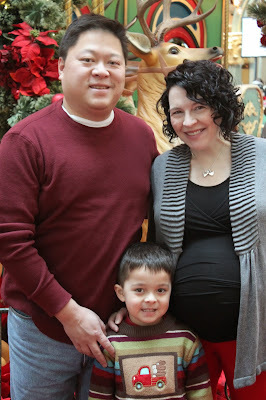 Have a blessed Christmas Leong Family! This made me cry. For you, for Ed, for Brian & for sweet Gavin. But also for the time you took to talk to Santa, for the Santa that was chosen to be there at the right time and the right place for your children...not just one year, but for two, and for the letter you wrote to Santa. And he remembered Gavin! You & Ed needed that just as much as Brian did. 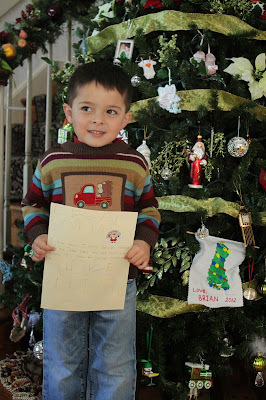 Such a very sweet visit with Santa and a very sweet post. This also reminds us that there are still very good, caring people in this world. Thank-you for sharing. Thank you so much for sharing. What a beautiful experience and such a wonderful Santa! 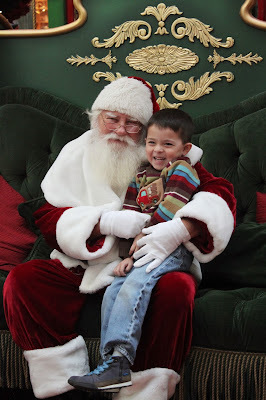 :) We took our little one to the KOP mall last year because we'd heard such great things about the Santa they had there, but he's retired this year. I would love to take her to see this Santa instead this year as he sounds like such a special man. Was this Plymouth Meeting Mall? Absolutely wonderful! Kate, are you "resting" and taking it "easy"? And cue pregnant hormonal tears. So awesome. Christmas is truly a magical time. Magic can be happy and sad. Its finding the happy medium of memories. Its about fighting your way to the smiles when crying would be the way thing to do. God bless you all. Christmas is truly magical. Happy magic and sad magic. Its about finding the happy medium between happy and sad. Its about finding your laugh and smile when all you want to do is cry. God bless you all. You truly are a beautiful family. Beautiful. One thing that draws me to your blog is the way you express your gratitude for everyone in your life. Even in the midst of a tragic (yet Hope-ful) situation, you manage to express your appreciation to everyone. From teachers to aids, nurses to doctors, photographers, artists, friends and Santa, you tell people how much they mean to you - and that is a beautiful, wonderful gift you have. I appreciate hearing you do this, as it teaches me how to be thankful for people in my life. And, Mr. Santa Claus sir, thank you so much for confirming what so many kids need to know - that yes, indeed, you do stop in Heaven. And, oh boy, what a special time he will have delivering beautiful gifts to an angel named Gavin and his little sister Darcy. They've already had the best gift any kid could need and that us loving, extraordinary parents. No doubt about it: the Santa you saw was the real Santa. I believe in him. I have to agree with Kristin above. That is one awesome Santa! What a wonderful Santa visit! Your family is so special; I'm so thankful that I stumbled across your blog. Ps. Brian's smile in that last pic is priceless. He has the best smile - what a happy guy! I have traveled with you on this journey of yours and there have been A LOT of posts that made me tear up and sniffle. THIS post, however... it was all I could do to not outright cry. And for all the "Negative Nancy" people out there-- You have handled them with a grace that many people couldn't even began to match. God Bless you and all of your babies-- can't wait to meet Hope when she makes her appearance!! This brought me tears of sadness and happiness. I miss Gavin like I knew him. I pray Brian has a good Christmas despite missing his brother. Kate, I'm often touched by your posts but have never commented before. This one touched me in particular though because it reminded me so strongly of my daughter (who was a cancer survivor) and her encounter with a particularly wonderful Cinderella. There was no particular reason for Cinderella to have gone out of her way to make her time with my daughter extraordinary and yet somehow she sensed exactly how much it meant to my family. It's been 10 years since that visit and I still get a bit teary remembering that particular magic. Best wishes to you and your family. You are doing a spectacular job navigating many challenges. Only you and Ed can truly know what is right for your family. Thank you for bravely sharing your journey. OMG. Grace on earth. Awesome.